This recipe for beer bread is worth it's weight in gold. It is so moist. When my sister-in-law Leslie introduced me to it at a family get together and I took my first bite, I could not believe how delicious is really was. Do you know what is better? ... It's the homemade dip that goes with it. I understand it was a recipe that was developed by Pampered Chef, and am I ever tickled that they did. This recipe for beer bread is everywhere on the internet, but I wanted it posted on my website too. It's worth it. I have even made sandwiches with it and toasted a beer bread slice and smothered it with butter - yum. But you decide for yourself. I know you have it in you. In a large bowl, sift the above ingredients together (a must). PREHEAT oven to 375 degrees; grease a loaf pan. Add the beer to the dry ingredients and combine slowly. Pour into the greased loaf pan and pour the melted butter over the dough. Bake for 1 hour. Combine the cream cheese and ranch dressing mix. Stir in the cheese, onion and finally the beer. Cover in a bowl and chill overnight for best flavor. And there you have it, a spectacular loaf of homemade beer bread - completely from scratch. A tasty little appetizer that also works well incorporating it in everyday meals or snacks. The dip also works well with crackers, pretzel sticks, carrots and celery (a spoon also works well). 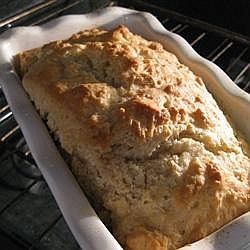 Below I have posted links to some of my homemade bread recipes that are popular on the internet. If you are looking for a recipe and cannot find it, please feel free to contact me and I would be happy to help you. Keep those emails coming - I love them, and if you have any ideas or recipes you would like to share, please send them to me and I will post them on my website. Thanks again.